This week we're back with a BRAND NEW show! We're going to pitch some ideas, celebrate the birthdays of Richard Whiting, Bennie Moten and Raymond Egan, and, for the first time on the show, we'll celebrate the addition of the 48th of the United States of America. That state? Oklahoma! 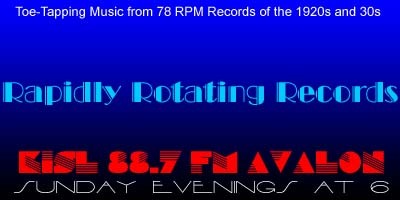 I think all of the records in the Oklahoma segment are making their RRR debut on the show, so let me know what you think of them. As always, just click on the link below to instantly listen streaming online and/or download the show. And of course, your comments, topic suggestions and requests are always welcome. Enjoy the show! Segment 1: I've got an idea! She's Got Great Ideas – Six Jumping Jacks / Tom Stacks, v.
That's My Idea – Matty Crawford's Orchestra (Adrian Schubert) / Jack Kaufman, v.
She's Funny That Way – Ted Lewis and His Band / Ted Lewis, v.
She's Sweeter Than Sugar / William Little, Jr. There Ain't No "Maybe" In My Baby's Eyes – Jan Garber AHO / Harry "Goldie" Goldfield, v.
If You See Sally – Lou Gold AHO / Scrappy Lambert, v.
Oklahoma – The Blue Jays (Harry Hudson) / John Thorne, v.